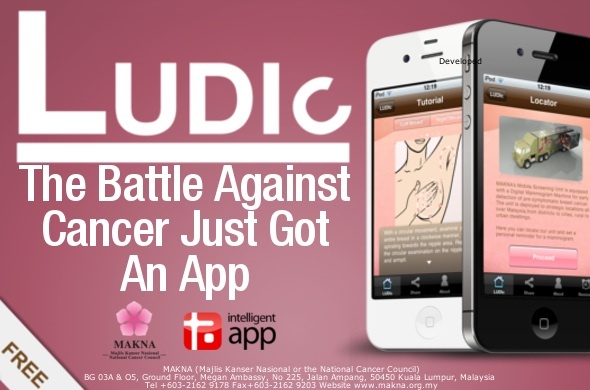 From whiteboard to iPhone, MAKNA (Majlis Kanser Nasional/National Cancer Council of Malaysia) and Intelligent App have developed a potentially lifesaving app in the form of LUDic a tool to take an interactive approach in the fight against breast cancer. Divided into 3 components – Understanding breast cancer, mobile screening locator and self breast examination tutorial – LUDIc hopes to stress the importance of early detection with a fun, yet educational application on a very relevant platform. Understanding breast cancer covers the anatomy of the breast, symptoms of breast cancer, progression, treatment and also prevention. With MAKNA’S mobile screening unit now on the road, the locator enables you to check for its location and even set a personal reminder to visit and have your mammogram done. Breast self- examination tutorial is a step by step illustration of how to conduct a self-breast examination, an easy breast cancer prevention routine. It is estimated that 1 in 4 Malaysians have a lifetime risk of developing cancer with breast cancer being the most common form of cancer affecting women. The numbers goes to show the importance of early detection and awareness and it is hoped that this application will be a good platform to enable women to be more informed about the tell-tale signs and symptoms of breast cancer and to have the confidence to act on it says Matheus Barrachi, Manager at MAKNA and the person who brought about the idea of LUDIc. Grab your copy on the iTunes App Store today! Urbanscapes, Malaysia's Leading Creative Arts Festival Turns 10!